This quick sketch of a monk was meant to keep publishing some art while I’m busy studying Preston Blair. Because his art is copyrighted and I don’t want to get targeted by lawyers of the biggest proponent of prolonging copyright ad nauseam, I can’t publish what I’ve drawn. Those drawings aren’t publish-worthy at this moment anyway, but that’s beside the point. 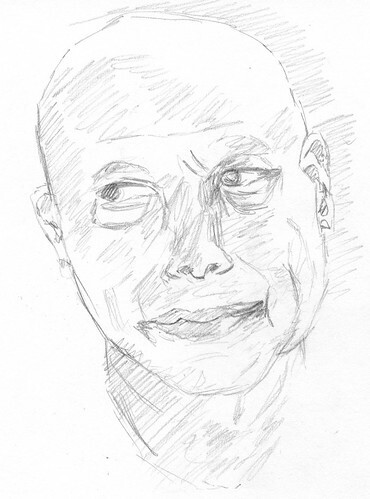 It is a quick sketch of 20 minutes, trying to get as much likeness into it without thinking too much about it. As much intuitive as I’m able to draw.